We are pleased to announce that we have upgraded our Web site’s Help section to serve you better! We have also expanded our Troubleshooting Index to address 25 questions our clients have asked. 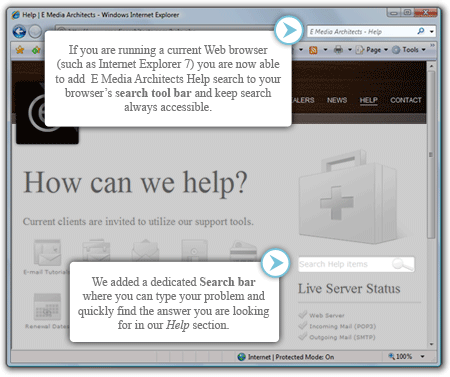 This self-serve knowledge database is available 24 hours-a-day by visiting our Web site at www.emediaarchitects.com/help We trust you will continue to find it an efficient time-saving tool. Do you have any comments or suggestions on our Help section? We’d love to hear from you.